Landingi is a fully-featured and cloud-based landing page editor that utilizes the Pixel-precise drag and drop (PPDD), visual editor style. It’s a reliable end-to-end solution that enables users to create, customize, and publish landing pages with ease. 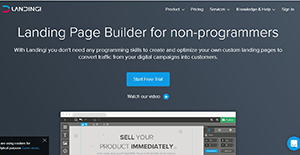 If you are a marketer or a business owner without coding and IT skills, this an ideal solution to create stunning landing pages that will capture more leads. Landingi is the go-to tool for marketers looking to create conversion-focused marketing campaigns. It provides 100+ high converting templates, Image and icon library, numerous fonts, move & copy elements, thank you page, one click duplication, AWS cloud hosting, image optimization, form creator & validation, ant-spam security, and lead insights. Its built-in integration enables you to automate the marketing stack and take it to a higher level. Landingi enables you to outshine your competitors with guaranteed landing page success rate. It excels in building and publishing catchy landing pages with a singular, well-structured goal to acquaint all customer with a valuable and clear message. It presents the most effective way to personalize landing pages for PPC ads and target audience. The software thrives on Amazon Web Services (AWS) thereby ensure encrypted accessibility and 24/7 uptime guarantee. The application has a robust page builder with multiple supreme features that grant unprecedented flexibility and ease of use. The drag & drop editor is one of its noteworthy features. The editor enables you to throw a splendid landing page together fast. It allows you to customize your landing page design and make the desired changes with no coding required. In addition, Landingi provides a HTML editor designed for the seasoned web developers and programming geeks with advanced HTML coding knowledge. The one-click duplication allows you duplicate your landing pages to test the usefulness of different marketing campaigns. Landing pages can also be optimized by running multivariate (A/B or A/B/X) testing of multiple page elements including buttons, pictures, forms, and text. The best thing is that the landing page designs are optimized for different devices. They look great on different devices including desktop, tablets, and smartphones. The designs are also highly responsive and promote brand consistency and reliability right across all devices. If you are considering Landingi it may also be beneficial to analyze other subcategories of Best Landing Page Software listed in our base of SaaS software reviews. Since each enterprise has specific business needs, it is sensible for them to abstain from searching for a one-size-fits-all perfect software solution. Needless to say, it would be pointless to try to find such a platform even among popular software applications. The clever thing to do would be to jot down the various essential factors that need consideration such as key features, finances, skill levels of staff members, company size etc. Then, you should do your groundwork thoroughly. Read some Landingi reviews and look into each of the other systems in your shortlist in detail. Such comprehensive homework can make certain you weed out ill-fitting systems and choose the app that offers all the features you require for business success. How Much Does Landingi Cost? We realize that when you make a decision to buy Landing Page Software it’s important not only to see how experts evaluate it in their reviews, but also to find out if the real people and companies that buy it are actually satisfied with the product. That’s why we’ve created our behavior-based Customer Satisfaction Algorithm™ that gathers customer reviews, comments and Landingi reviews across a wide range of social media sites. The data is then presented in an easy to digest form showing how many people had positive and negative experience with Landingi. With that information at hand you should be equipped to make an informed buying decision that you won’t regret. What are Landingi pricing details? What integrations are available for Landingi? If you need more information about Landingi or you simply have a question let us know what you need and we’ll forward your request directly to the vendor.